Link will be automatically emailed after payment to the address used in paypal. 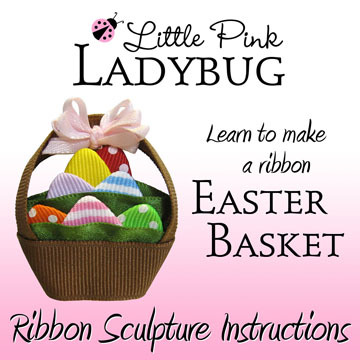 Learn to make this exquisite Easter Basket with Eggs! Originally handcrafted by master ribbon sculptor, Karyn Ranzau. You will have each design carefully broken down step by step to recreate these mini masterpieces for yourself. 55 photos and 15 full pages of simple instructions will guide you through this engaging art. Finished creations make wonderful hair accessories, lapel pins, ornaments, household decorations or gift toppers. Don't miss out! Make these adorable clippies yourself! Our new forum here is available for helping out with questions, details and tips, exclusively for those who purchase instructions. If you ordered from another site, please email your order number and you will be granted access. This item is not available for wholesale. Any wholesale purchases will be cancelled. Due to the nature of this product there are ABSOLUTELY NO REFUNDS. Disputed purchases made with credit card must go to their credit card company. Funded paypal or bank transfers are not disputable once the ebook has been sent.